Explosion rips through Aliso Viejo medical building, killing one and injuring three others. 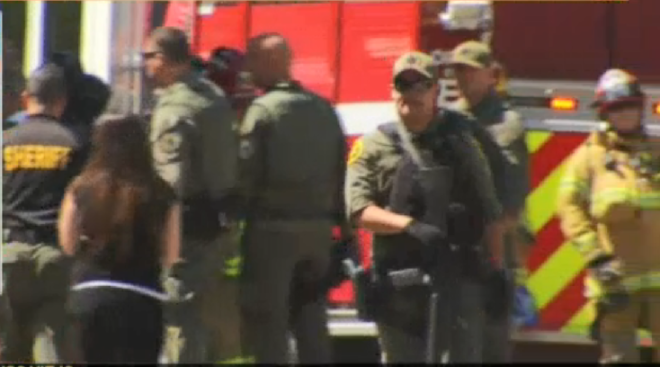 Nearby day care and preschool Academy on the Hills was evacuated, but all children are safe. There is no lingering threat to the surrounding community. 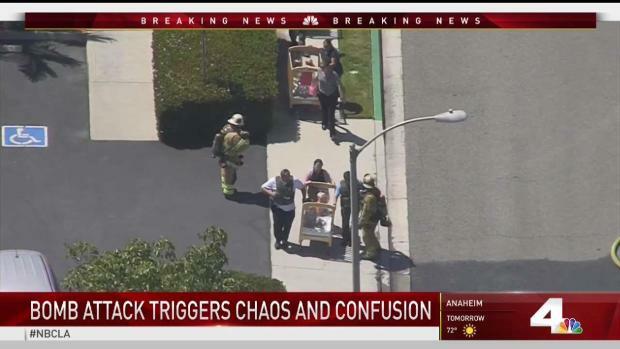 The explosion at an Aliso Viejo medical building was an "intentional detonation," and the explosive device was delivered to the building, addressed to a specific person, federal sources tell the NBC4 I-Team. One person was dead and at least three were hurt after an explosion ripped through a medical building in Orange County, forcing children in a nearby day care to flee, as bomb squad investigators combed the scene, authorities said Tuesday. Crews extinguished a fire that had erupted in the building that was under construction. 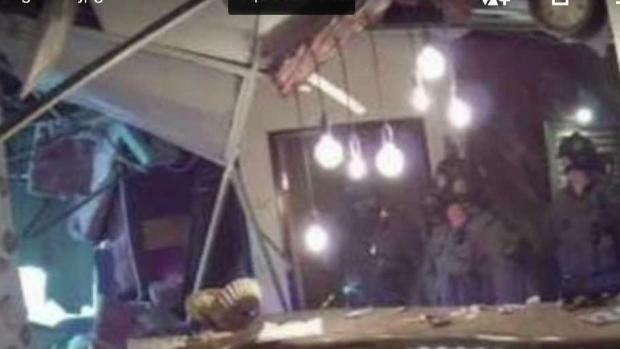 Bomb squad investigators and FBI agents were looking into the cause of the blast, but authorities assured the public that there was no lingering threat to the community. Initial reports say that the explosion was not being considered suspicious. Witness Mary McWilliams described a chatoic scene immediately following the explosion, saying she saw bloodied women fleeing from the building, their faces covered in ash. She said one of the women's hair was singed and the other had skin peeling off her wrist. One person was killed and three others were taken to a hospital after an explosive device detonated in an Aliso Viejo medical building. Hetty Chang reports for the NBC4 News at 11 on Tuesday, May 15, 2018. One of the fleeing women said, "take care of my mother, take care of my mother." The explosion was initially reported as a car crashing into the building around 1 p.m. Tuesday at 11 Mareblu in Aliso Viejo off of Route 73, the Orange County Fire Authority confirmed. Later, the Orange County Sheriff's Department spokeswoman Carrie Braun said that no car was involved and they were investigating how the explosion occurred. Authorities said there were at least three patients transported. Children were being rolled in cribs and walked hand-in-hand down the street from Academy on the Hills day care and preschool at 10 Mareblu, just across the street from the blast site. Hundreds of children, from age six weeks to 6 years old, attend the center. The center was not affected by the blast, but staff reunited parents with their children in a Target parking lot at 26932 La Paz Rd. Nearly 100 children were rushed out from their daycare after an explosion detonated at a nearby medical building in Aliso Viejo. Kim Baldonado reports for the NBC4 News at 11 on Tuesday, May 15, 2018. "There was a big explosion!" 5-year-old Lance Miller said, reunited and in the arms of his mother after the dust had settled. Tony Dik, whose son also attends the preschool, said the whole ordeal was very emotional as parents realized their children were on the same street as the explosion. "When I was playing outside I heard the big crash, I thought it was a garbage truck but it was a building that smashed," his son, 6-year-old Kingston, said. There was a full street closure of Pacific Park heading eastbound to the Aliso Plaza, and a full closure of Pacific Park westbound to Moulton due to the blast. If you need information about loved ones who may be involved, you can call this OC Fire Authority hotline for more information: 714-628-7085. New pictures and new information on the explosion that was "intentional" have just been revealed. Hetty Chang reports for the NBC4 News at 6 Tuesday, May 15, 2018.